ONE PERK OF BEING IN THE SECRET RECIPE CLUB IS GETTING TO SEE SO MANY DELISH RECIPES FROM BLOGS THAT ARE NEW TO ME!!! THIS RECIPE WAS MADE ORIGINALLY BYBIG BEAR’S WIFE AND FEATURED FOR THE SECRET RECIPE CLUB BY VERONICA’S CORNUCOPIA. HAVE FUN CHECKING OUT BOTH OF THEIR BLOGS. AS FOR THESE BARS…IF YOU LOVE MARASCHINO CHERRIES, THESE ARE FOR YOU! PAIRED WITH A COOKIE CRUST AND A CHOCOLATE GANACHE…HELLLO! 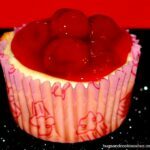 LIKE A BIG CHOCOLATE COVERED CHERRY MEETS CHEESECAKE & COOKIES!!! Preheat oven to 350°F. In a large bowl, cream together the butter and sugars for 3-4 minutes, until the mixture is light and fluffy. Add the egg and extracts and mix until blended. Add half the flour, baking powder and salt. Mix. Add remaining flour and mix just until flour is incorporated and the dough is smooth and soft. Spread and press dough into the bottom of a 9”x13” baking dish. Bake 15 to 20 minutes or until light golden brown. Meanwhile, in small bowl, beat 1 egg white until frothy. Brush egg white over crust. Bake 3 minutes longer or until egg white is set. Meanwhile, in large bowl, beat cream cheese with electric mixer on medium speed until smooth. Add egg yolk, 2 eggs, the condensed milk, almond extract and food color; beat until well blended. 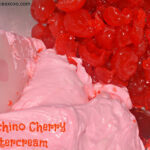 Stir in chopped cherries. 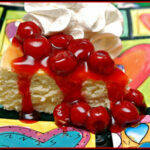 Pour cherry mixture evenly over crust. Bake 20-25 minutes longer or until set. Cool completely, about 45 minutes. Meanwhile, in medium saucepan, heat chocolate chips and butter over low heat, stirring frequently, until melted and smooth. Remove from heat. Cool 20 minutes. Stir whipping cream into chocolate mixture until well blended. Spread over cooled bars. Refrigerate about 30 minutes or until chocolate is set. For bars, cut into 8 rows by 6 rows. Store in refrigerator. yay! so glad you liked them enough to share them!! OMG. Im making these. They are also going to be Christmas gifts ,instead of the “boxed choc. cherries.” Thanks so much. OOOOO! 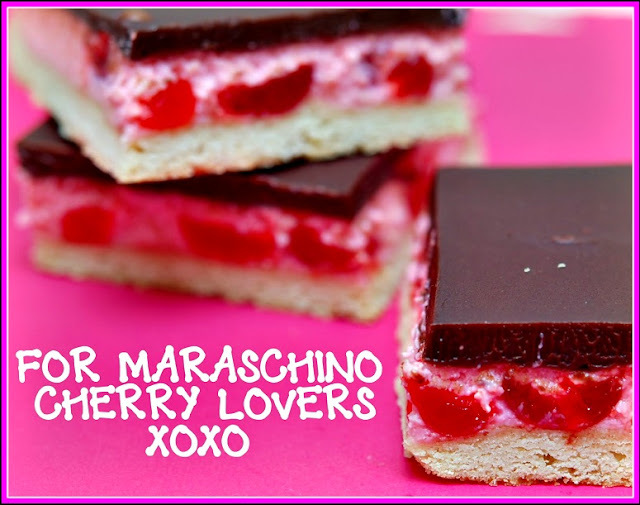 I do love a marciano cherry ‘ANYTHING’!! Looks REALLY good!!!! These sounds and look amazing! Thanks for linking up! THANKS 4 THE HONOR! GRABBED MY BUTTON! Just found your site… So many stinkin cute things!! I think we need to be friends. Thanks so very much! Happy holidays to you, too! 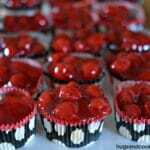 making for Valentines thks for sharing!! !